After all the work I poured into making the Aeolian Shawl, I did not learn my lesson and have decided that making 7 stitch nupps is THE BEST THING EVAR. So I decided that I would use Estonian lace patterns in Elizabeth Zimmermann’s Pi Shawl because my regular knitting and two small children just isn’t enough. This is the swatch I made using some Arauncania Ranco on size 6 (4.0mm) needles. It looks very pretty and gave me a good idea on how the patterns worked with the pi increases, but I needed a larger needle for the nupps to stand out. 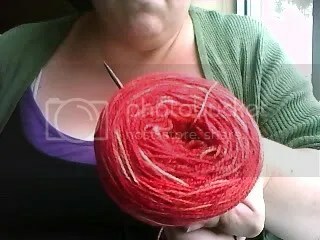 I had 3 skeins of Knit Picks Gloss Lace set aside for the project and I dyed them up on Thursday. I need to make new dye stock solutions because there has definitely been some fading and it took two goes to get the color that I really wanted. I used my crock pot and Jacquard dyes and couldn’t be more pleased with the outcome even if I did have to mess about with the colors more than I usually would. 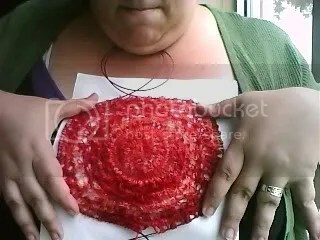 So I finished charting the lace on Friday night and cast-on. I’ve just started the 24 round section. In other knitting news, I made a lot of progress on my Giselle sweater. I’ve made a big dent in the lower portion of the sweater and since I’ve hit the point of decreasing every other row, it’ll go even faster. 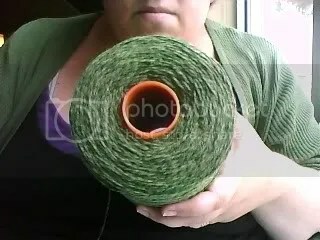 This is what is left of my 2lb cone of Provence Lace Merino from School Products. It may not look all that small, but the diameter of the cone is at least half of what it was. I figure that by the time I’m done Giselle, I should have about 800yds left which should be just enough to make a pair of stockings. 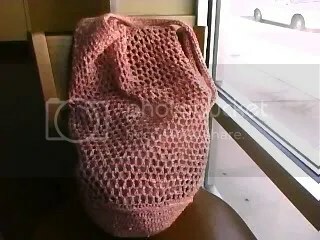 If you have the chance to go there, I highly recommend it – I paid just over $50 for this cone and I’m getting a large lace shawl, a size 3x sweater (with yarn doubled) and (hopefully) a pair of lace stockings or at least lace knee highs. I don’t have it with me, but a dear friend treated me to some sock yarn this weekend in a lovely brown/gray colorway and for the life of me I can’t remember just what it’s called so that will have to wait for the next post. TTFN and I promise that I’ll get the camera dug out so I can get proper pictures of things up. Which equates to .64 miles of yarn. 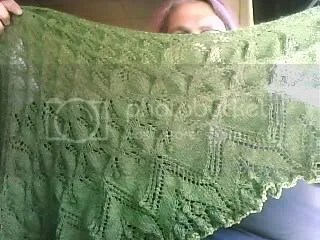 The knitting on the shawl of DOOM is finished. As I am battling a nasty head cold, bad webcam pics and a worse cell phone shot will have to suffice for now. It is gigantic! Unblocked, the top is at least 60″. It’s long enough that I can wrap it around me comfortably. Next step is trying to find a place big enough to block it and one where it can rest undisturbed until it’s dry. Welcome to the new Knitty Keen blog – long time no see! It’s a rainy, yucky day today. One of those days where playing with wool is the last thing you really want to do, but seeing as I’m in the middle of row 39 of the final chart for the Aeolian Shawl, I’m willing to take one for the team just so I can get the damned thing finished. I’ve taken to calling it the shawl of DOOM everywhere and while it is beautiful, oh so beautiful, I’m at the stage where one row takes close to 30 minutes to complete. Here’s hoping I can get it off the needles by weeks end.